You’ve probably heard that you should drink water, but how much is enough? Can you drink too much? The information regarding water intake varies, with some suggestions saying you should drink eight glasses of water a day and others suggesting two liters a day for women. If you keep in mind that your body is made up of at least 50% water, you will want to make water your beverage of choice as often as you can. One trick to drink more water is to keep a glass of water by you at all times and use a straw. If you think about it, keeping your body hydrated can only help all of your organs function better. You can read more about that in some of the posts below. One of the side effects of drinking your recommended daily allowance of water is that you look younger and better. To learn all you’ve ever wanted to know about water, check out these 27 blogs. 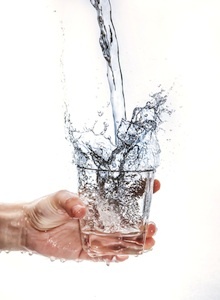 Drinking water and losing weight has been a hotly debated topic. These nine blog posts will explain in detail what the debate is about, but the short story is that drinking water alone will probably not cause you to lose weight. However, drinking water before and after meals can help you feel fuller and cause you to eat less. If you drink water your organs will work better and rid your body of harmful toxins that could be causing you to retain water. Also, by drinking water you are activating the fiber that you should also be eating if you are trying to lose weight, which will help you shed some weight. So while drinking water doesn’t make you lose weight by itself, it certainly can be a very helpful tool in your weight loss journey. Read more about the science of this in these nine blog articles. Benefits of Drinking Water… For Weight Loss Perhaps? Many of the organs in your body are made up of mostly water. If you don’t drink enough water, your organs will try to steal water from your hair and skin to get the water they need to work. If they still can’t get enough water, they won’t work to their full potential. Water will help improve your immune system because it allows your body to fight off illness as long as you are properly hydrated. If you get frequent headaches, the solution may be as simple as drinking more water. The brain is made up of nearly 90% water and if you are constantly dehydrated you will be tired and slow thinking. Combine that with being more prone to headaches and you can see why drinking water is so important for organ function. When you consider that dehydration causes your organs to steal moisture from your skin, hair, and fingernails, you can see why getting enough water might help you look better. Your skin will be more supple and radiant, your hair will be shinier and fuller and your nails will grow longer and be less brittle. One of these blog articles even calls water the fountain of youth. For more information on how drinking water can help improve your appearance, check out these nine blog entries.